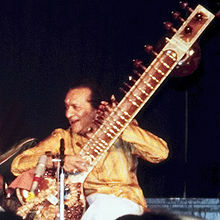 Ravi Shankar, KBE (IPA: [ˈrɔbi ˈʃɔŋkɔr]; 7 Aprile 1920 – 11 December 2012), born Rabindra Shankar Chowdhury, his name eften precedit bi the teetle Pandit ('Master'), wis an Indie muisicker an a componer o Hindustani clessical muisic. He wis ane o the best-kent exponents o the sitar in the seicont hauf o the 20t century an influenced mony ither muisickers throuoot the warld. ↑ "East Meets West Music & Ravi Shankar Foundation". East Meets West Music, Inc. Ravi Shankar Foundation. 2010. Retrieved 12 December 2012.